Apple has been following a yearly update schedule for both their phone and computer software for a while now, and as such iteration, not revolution, had been the norm. That is, until the release of iOS 7. Under the watchful eye of design wunderkind Jony Ive, the look and function of the entire system was rebuilt from the ground up, resulting in the most enjoyable and intuitive iPhone experience ever. With their latest computer operating system, OS X 10.10 Yosemite, Apple are attempting to repeat the trick. Ive has been given the reins again, and has a remit to do whatever it takes to bring OS X up to date. I signed up for the Beta mailing list, and received a code in early August. I’ve been using Yosemite on my day to day machine ever since. Read on for my thoughts and first impressions. Well it’s certainly pretty. From the updated system font (goodbye Lucida Grande, hello Helvetica Neue), to redesigned app icons, to the subtle use of translucencey in system apps – Yosemite is full of little aesthetic touches that make for a delightful user experience. Icons in the dock no longer sit awkwardly above it in an attempt at creating a sense of 3D depth. Instead, they lie flat on a band of frosted glass suffused with the colour of your background image. Touches like these catch the eye for a while after installing, but soon fade into the background, making for a elegant and visually pleasing experience. You could construe this as underwhelming, accusing it of feeling insufficiently new or different. However, I’d argue that Apple have cleverly avoided the temptation to go too far, to be overly futuristic (which can be as bad as out of date design), and instead have created a presentation that feels very 2014. In other words, when using Yosemite you are struck that this is exactly how a computer interface should feel. In fact you might even feel a slight annoyance that things haven’t always been this way. As per usual, Mail, Calendar, iTunes, Safari, and the rest of the OS X suite of apps have received upgrades. Beyond the application of the new unified design language, changes are in the functional-but-not-life-changing category. Safari has been stripped down to the very basics, allowing web content to take centre stage. It’s also considerably faster than the previous version. For the first time in a while, Chrome has a challenger for my main web browser. Elsewhere, Mail now has the ability to annotate messages and fill out forms in the reply window, which should reduce some of the more tedious aspects of email. Probably more useful, Messages can now link to your iPhone, allowing you to send and receive SMS straight from your computer. The bundled apps were always pretty good, and they have only been made better with the upgrade. They are of limited use to me, but if you for some reason use desktop based email (why? ), or listen to music on iTunes, then you’ll be pleased with what Yosemite has to offer. There are interesting tweaks and impressive new tricks all over the system, although it remains to be seen how many of them will become day-to-day essentials. 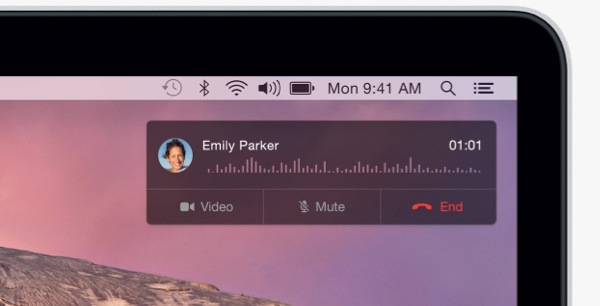 I touched on the ability of Yosemite to link up with your phone over bluetooth to send SMS, but this connection also allows you to take calls through your computer using the built in mic, and seamlessly move from working on your phone to your laptop and back again. System browser Finder now has tabs, to allow more organised browsing of your files. The almighty Spotlight search (see image above) now takes centre stage, appearing in a large box in the centre of the screen ready to show you results from all your files, media, and the web. I have always been a heavy Spotlight user, but the updated version is so useful for so many reasons that I think many people will find themselves relying heavily on the Cmd + SPACE shortcut. 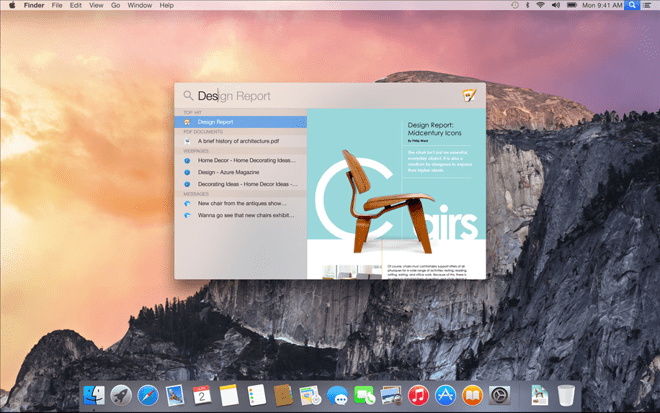 Despite only being Beta, Yosemite is already extremely impressive. Excellent design, a few interesting new features, and the usual load of under the hood techie updates have combined to create a very polished and functional OS. With it being a Beta there are obviously a few downsides with stability and other things (my battery life is a joke – an Apple Beta classic), but these things usually get ironed out by release time. In the end, it doesn’t quite live up to the revolutionary jump of iOS 6 to iOS 7, but nor is it another set of minor tweaks. Apple fans and general users itching for a refresh should be looking forward to the general release this Autumn.